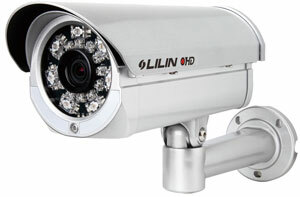 Lilin have recently released a range of IP security cameras with a number of useful features, including HD quality resolution, infra red night-vision and easy mobile viewing, providing an effective CCTV solution for round the clock surveillance monitoring. The new Lilin range makes use of 720p HD resolution, resulting in sharper images. CMOS image sensors with progressive scan help to reduce motion blur and H.264 streaming technology helps keep file size low while not reducing image quality, useful for security solutions in busy environments. Lilin’s new range of outdoor cameras come with intergrated infra red LEDs to provide illumination for distances from 16 metres to up to 40 metres in the case of the Lilin IPR-414ESX. The cameras also come with a built-in infra red cut filter that automatically switches between full colour HD during the day and black and white images at night for night-time surveillance. Another great advantage of this new Lilin range is that they can be viewed remotely using smartphone devices such as iPhone, and Android phones. E-mail alerts can be set up to notify you when motion is detected, but this is common within all IP cameras. Many of the cameras, including the Lilin IPR-712S, have SD card slots included, offering back up recording in the event of network issues, which is also quite a handy feature if you are looking for stand-alone camera operation. The cameras can be powered using Power over Ethernet, helping to save on cost and installation time, while aluminium IP66-rated cases help protect them from acts of vandalism and the harshest weather conditions. If you’re looking into complementing the cameras with some recording software, the range is compatible with Milestone Essential or Milestone Express video management software, providing an all-round robust recording solution. There is also a indoor network camera available within the range, the IPD-112ESX, providing the same HD 720p resolution for use in an indoor environment but without the infra-red support built-in. This is a step into the world of HD for Lilin, and we’re impressed by what we see so far, you can view the entire range in our IP camera store.